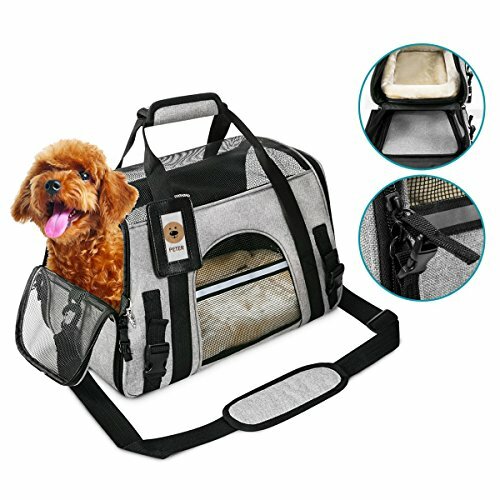 [ULTRA VERSATILE]: Small dogs, cats, puppies and kittens will love this roomy pet carrier with a large side entry.Upgraded to reinforced Polyester & claw-defense mesh on top and 4 sides ensure your pet ample ventilation and airflow. It can be side loaded: use the durable zipper locks to open or close the carrier any time. Wherever life takes you and your pet, our pet carrier will ensure your pet arrives there safely and comfortably. [AIRLINE APPROVED]: The soft sided pet carrier complied with company airline sizing standards for placing the carrier under the seat. Small cats, tiny dogs and toy breeds find this carrier spacious and comfortable for airline and car travel. [LEASH TETHER & PADDED MATS]: Ensure your furry friend is safe and secure. You\'ll feel at ease knowing your kitten or pup won\'t escape as you can attach their leash to the interior hook. Fleece & oxford cloth padded mats ensures your pet\'s comfort whether in winter or summer. [EASY TO USE & STORE]: You can use it as a tote carrier bag or shoudler carrier bag that be with a adjustable padded shoulder strap, the carrying handles with a pad be stick up for a comfortable hand feel. Use the side pocket for snacks, toys, collars, a harness, clothes, grooming supplies, accessories, stuff. All around superior construction makes this the top pet travel handbag carrier style anywhere! [100% SATISFACTION GUARANTEE]: Pet soft sided carrier with 17\" X 10\" X 11\" size can carry small dogs to medium sized cats. We suggest you to measure your pet before purchasing to save yourself time. If you have any question, please contact us and will get response in 24 hours. There\'s no risk to buy now.